The Payroll Edge offers professional employer organization (PEO) services to Canadian, US, and international companies expanding their workforce into Canada or the United States. We make it easy to expand your workforce without worrying about foreign compliance. Our employment solution enables you to employ workers in Canada and the US quickly and compliantly, while eliminating the daunting task of establishing a legal entity in a foreign country and understanding local employment standards and laws. If you’re a Canadian business owner looking to employ US talent or expand your operations into the US, The Payroll Edge can help you employ workers using our infrastructure for compliance, which includes HR support and needed contracts. We become the employees’ legal employer of record and handle risk management, regulatory compliance, payroll, and HR support. 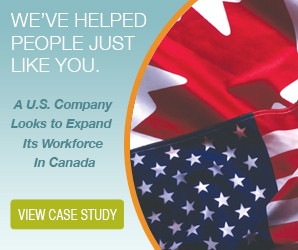 US-based companies often hesitate to expand their workforces into Canada due to common challenges that include infrastructure, compliance, and payroll. When you partner with The Payroll Edge, you can take advantage of our Canadian infrastructure and let us handle compliance, payroll, benefits, and risk mitigation, so you can get back to business. North America offers great business opportunities for global companies. Whether you're looking to penetrate the US or the Canadian market, by employing talent in either country, The Payroll Edge is the partner you need to navigate the hurdles of international expansion.